Can this common herb improve memory and reduce cancer risk? Sage is an herb commonly found on your spice rack. Sage is usually dried and used to flavor to favorite entrees and sides but also has medicinal properties that people have used for centuries in both Eastern and Western cultures. In recent years, scientists have looked into how effective sage or sage extracts are in preventing or treating common medical conditions. There are numerous varieties of sage used for culinary and medical purposes, the most common of which is Salvia officinalis (also known as common sage). Other edible varietals include Salvia lavandulaefolia and Salvia plebeia. As far-reaching as some of these benefits may seem, there is evidence, albeit sparse, to support the claims. Among the components of sage believed to have therapeutic properties are camphor, carnosic acid, carnosol, and phenolic acids. Camphor is the oily substance that gives sage its pungent aroma. Popularly used in topical creams and ointments, camphor actively stimulates nerve endings, producing a warm sensation when vigorously applied or a cool sensation when applied gently. Carnosic acid and carnosol both have antioxidant and anti-inflammatory properties. They directly activate a molecule known as peroxisome proliferator-activated receptor gamma (PPAR-gamma) that helps regulate blood sugar, lipids, and inflammation, among other things. Phenolic acids are plant-based chemicals that exert significant antioxidant properties, protecting cells from the oxidative damage caused by free radicals, including the heart and brain. Sage may be beneficial in providing relief for inflammatory conditions such as sore throats and sunburn. A 2009 study from Switzerland showed that an extract of sage and echinacea, when used as an oral spray, was just as effective in treating an acute sore throat as the combination of chlorhexidine and lidocaine, pharmaceutical drugs commonly used in oral anesthetics. A 2013 study further reported that sage oil exerted both anti-inflammatory and antibacterial effects, providing relief of mild inflammatory skin conditions like sunburn and folliculitis. It is these same properties that are believed to be effective in relieving tonsillitis pain or speeding the healing of cold sores when applied as a salve or ointment. Sage's activation of the PPAR gamma molecule may be most apparent in its impact on cholesterol. One study, published in the journal Phytotherapeutic Research, concluded that this effect more than marginal. Total cholesterol levels were lowered by 16 to 20 percent. Low-density lipoprotein (LDL) cholesterol (a.k.a. "bad" cholesterol) was reduced by at least 12 percent. High-density lipoprotein (HDL) cholesterol (a.k.a. "good cholesterol) was increased by up to 20 percent. Triglycerides were lowered by at least 18 percent. Other studies have not demonstrated similar results. Moreover, while the activation of PPAR gamma is associated with improved blood sugar, this effect has not been seen when taking sage or a sage extract. Hot flashes and night sweats are common occurrences in women experiencing menopause. A 2016 study published in the International Journal of Medical Research and Health Sciences reported that a 100-milligram daily dose of S. officinalis, delivered in an oral tablet over eight weeks, reduced the incidence of these and other menopausal symptoms when compared to women who took a placebo. Moreover, it appeared to do so without influencing hormone levels. What this confirms is that, while sage may improve symptoms of menopause, it is unlikely to help women with abnormal periods since the disorders are primarily influenced by hormone levels. As far-fetched as it may seem, there is evidence that sage can improve memory and information processing, even in people with Alzheimer's disease. While the evidence remains sparse, a 2017 review of studies suggested that substances in sage can influence biological mechanisms associated with cognition. According to the research, two types of phenolic acid found in sage, rosmarinic acid and caffeic acid, have been shown to improve alertness and cognitive skills in mice. Two human studies—one involving 11 people with early Alzheimer's and the other involving 30—reported overall improvements in cognition as well as a reduction of neuropsychiatric symptoms after using a ﻿Salvia extract. Other studies included in the review consistently showed improvements in short-term memory, alertness, and speed recall. Improved mood and alertness were also cited. Perhaps the most controversial claim by alternative practitioners is that sage can help prevent cancer. That is not to suggest there is no evidence to support these claims; it's just that most of it has been limited to test tubes. Within this context, scientists have been able to prove that components of S. officinalis or S. lavandulaefolia (including carnosol, rosmarinic acid, and ursolic acid) can inhibit the growth of cancer cells in test tubes, including breast cancer, colon cancer, chronic myeloid leukemia, prostate cancer, liver cancer, and small cell lung carcinoma. While test tube results infrequently translate to humans, a 2013 review of studies reported that rosmarinic acid given daily to mice was able to prevent skin cancer as well as bone metastasis from breast cancer. While none of this should suggest that eating or drinking sage can prevent cancer, the current body of research may help pave the way to the development of effective anti-cancer drugs in the future. When consumed for culinary purposes, sage is considered safe in adults and children. By contrast, when used for medicinal purposes, sage or sage extract can be harmful if overused or used for a long period of time. This is because sage contains thujone, a neurotoxin responsible for the mind-altering effects of the alcoholic beverage absinthe. 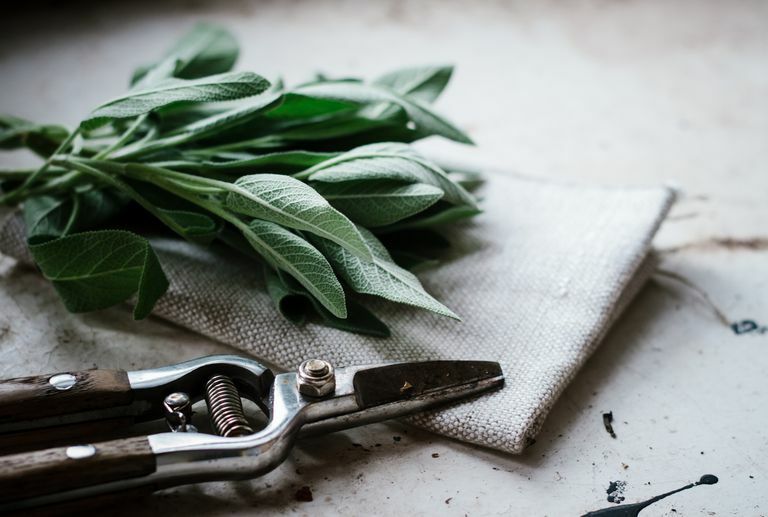 If consumed in excess, sage can trigger potentially serious side effects, including restlessness, vomiting, dizziness, rapid heart rate, tremors, seizures, and kidney damage. Sage essential oil is especially toxic, causing adverse symptoms with as few as 12 drops. Because of this, sage essential oil should never be taken orally. Even when applied topically, the oil can cause rash or irritation if not diluted. Sage can also make anticonvulsant drugs less effective in used in excess, including phenobarbital, Mysoline (primidone), Depakote (valproic acid), Neurontin (gabapentin), Tegretol (carbamazepine), and Dilantin (phenytoin). The excessive use of sage in people on diabetes medications can also trigger a potentially severe drop in blood sugar, leading to hypoglycemia. If using sage capsules or extracts, never consume more than the recommended dose on the product label. Sage medications should be used with caution in people with impaired kidney function. Advise your doctor about any medications you are taking, including herbal remedies like sage, so that you are fully aware of the potential benefits and risks. When used for health purposes, sage can be found in oral extracts, gel caps, and capsule formulations as well as topical creams and ointments. There is no standardized dosage, but doses of up to 1,000 milligrams per day are generally considered safe and well tolerated. Topical sage creams are intended for short term use and should only be applied as directed. Dried and fresh sage can be found at most grocery stores. Sage powders, capsules, extracts, teas, essential oils, and homeopathic remedies can be readily sourced online or at retail drugstores and health food outlets. If purchasing a sage supplement, try to find one that is manufactured to the highest quality and safety standards. The best way to do this is to check the label for a seal of approval for an independent, third-party certifying body like the U.S. Pharmacopeia (USP), NSF International, or ConsumerLab. While it may seem safe to assume that sage tablets or gel caps are vegan- or vegetarian-friendly, it's not always the case. Gel caps, in particular, are sometimes made animal gelatins rather than vegetable cellulose. To be safe, only purchase products labeled "vegan" or "vegetarian." Dawid-Pać, R. Medicinal plants used in the treatment of inflammatory skin diseases. Postepy Dermatol Alergol. 2013 Jun;30(3):170-77. DOI: 10.5114/pdia.2013.35620. Ghorbania, A. and Esmaeilizadehb, M. Pharmacological properties of Salvia officinalis and its components. J Tradit Complement Med. 2017 Oct;7(4):433-40. DOI: 10.1016/j.jtcme.2016.12.014. Kianbakht, S.; Abasi, B.; Perham, M. et al. Antihyperlipidemic effects of Salvia officinalis leaf extract in patients with hyperlipidemia: a randomized double-blind placebo-controlled clinical trial. Phytother Res. 2011;25:1849-53. DOI: 10.1002/ptr.3506. Lopresti, A. Salvia (Sage): A Review of its Potential Cognitive-Enhancing and Protective Effects. Drugs R D. 2017 Mar;17(1):53-64. DOI: 10.1007/s40268-016-0157-5. Rad, S.; Forouhari, S.; Dehaghani, A. et al. The effect of Salvia officinalis tablet on hot flashes, night sweating, and estradiol hormone in postmenopausal women. Int J Med Res Health Sci. 2016;5(8):257-63. Schapowal, A.; Berger, D.; Klein, P. et al. Echinacea/sage or chlorhexidine/lidocaine for treating acute sore throats: a randomized double-blind trial. Eur J Med Res. 2009;14(9):406-12. DOI: 10.1186/2047-783X-14-9-406.